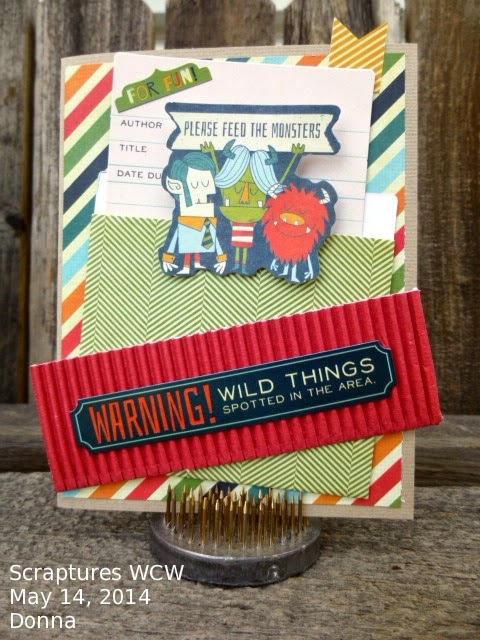 This week's Wild Card Wednesday challenge is to make a card with no stamps and no inks...just the accessories and embellishments that come with the card kit. Shouldn't be too hard to do the "Be Different" (Fancy Pants) card kit comes with soooooo much cool stuff. Not sure if it's because I have an 11 year old monster of my own...but I am totally loving the little monsters in the kit! They are so cute and colourful! I thought this would make a cute birthday invitation if you wrote out the party info on the library card. Want to join in on the fun?? Visit the SCRAPTURES store to check out this and other awesome card and scrapping kits and join us on the forums! Love it..but I HAVE to ink the edges of the elements and paper. I'm totally in love with these monsters! And what a great idea for a birthday invite - LOVE the library card! Great card there Donna. It would be great for a little monster!